Note: This game was played on a 25 inch-HD tv. The console was connected to the tv using S-video cables. Note 2: This will not be an in-depth review by any account, just a brief overview and short review of this obscure game. I’ve been too busy to do many reviews lately, so this is the best I can do at the moment! Quick History: Muscle Bomber: The Body Explosion was released for the FM Towns computer and FM Towns Marty game console in 1993. It is a port of the Japanese arcade game of the same name. The game was also released for the Super Nintendo and Sega Genesis under the name Saturday Night Slam Masters (see my SNES review). Players: 2 players VS option, or 1 player single match campaign for World Championship. 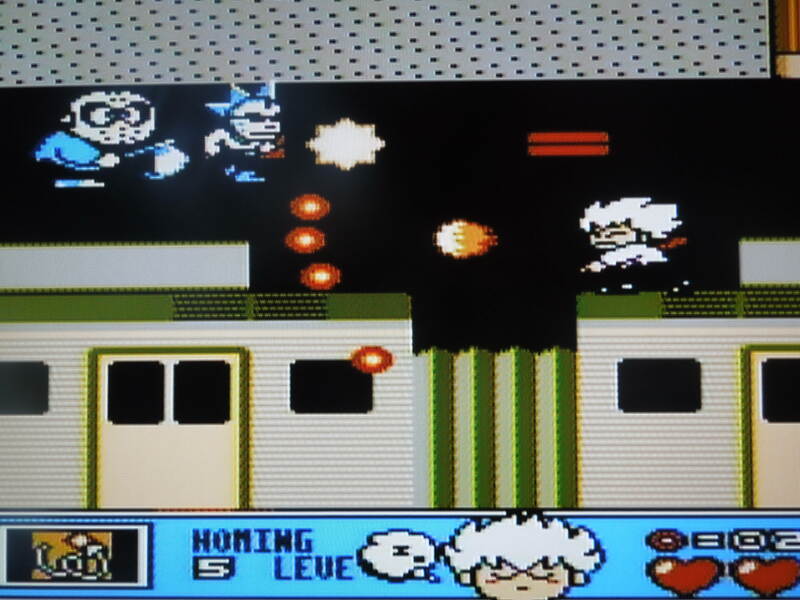 Modes: Muscle Bomber has only one mode of play, unlike other versions of the game. In this FM Towns Marty version, there is no Team Battle Royal Mode where you could play co-op versus 2-computer controlled characters or other human players. There is only the Single Match mode, where you must battle through the roster of wrestlers twice – once to win the Championship, and once to defend your title. Gameplay Options: In the Options menu, you can change the screen resolution, which as far as I can tell, changes the size of the game on the screen mainly, change the difficulty among 7 settings, and change the controller configuration, among a few other small things. The FM Towns Marty controller is a very basic controller with only 5 buttons – Run (Start), Select, B, A, and an unlabeled shoulder button that I believe is used to change the screen resolution in-game on some FM Towns Marty games. Wrestlers: There are 8 selectable wrestlers in Muscle Bomber. Aleksey Zalazof, Luck Colt, Mysterious Budo, Titan the Great, El Stinger, “Macho” Mike Haggar (from Final Fight), Sheep the Royal, and Gomes. There are 2 unselectable boss characters whom you must square off against named Kimala and The Astro. Each wrestler has their own specific look and movelist, although Zalazof and Colt are quite similar. Control: B punches or kicks, depending on your wrestler. A jumps (which you can follow up with an attack by pressing B). Select “Falls” (Pins). Moving in close to your opponent and pressing Toward + B grapples, then pressing B + Left or Right whips (sends running) your opponent across the ring, where they will bounce off the ropes and come back towards you for an attack. In a grapple, Up or Down + B executes a wrestling move, like a body slam, pile driver, backbreaker, etc., depending on your wrestler. Most wrestlers also have a submission hold that can be executed from the grapple position. If you lock it on while your opponent has no energy left, they’ll give up and you can win that way. All wrestlers also have a special “finisher” they can execute by pressing a particular controller directional combination and button combination while in a grapple (simple – for example, rotate the directional pad in a 360 motion and press A + B to execute Haggar’s spinning pile driver) or a unique standing attack by pressing B repeatedly or pressing B + A. Simple, and easy to master. You can climb on the turnbuckles by tapping toward them twice, and jump off for a flying attack. Match Length: Each match in Muscle Bomber lasts exactly 3 minutes, and it goes fast. If time runs out with no winner, whoever has the most energy wins. However, if both wrestlers have the exact same amount of energy (for example, if both have depleted energy bars but no one has made a pin or submission) and time runs out, the word “Draw” will appear on the screen. However, the game will then declare “Tie Break!” and you’ll be granted 1 additional minute to see if someone can win it. I’m not sure what happens if no one is able to win in that final minute. I would imagine a proper draw and you’re forced to start the match over. Outside the Ring: You can roll out of the ring to fight, but in this version, there are no chairs, tables, or any other weapons to pick up and attack your opponent with. It’s still satisfying to pile drive them on those blue mats though, and you can still whip them into the steel railing for damage. If you don’t answer a 20 count and return to the ring, you’ll lose that way (or win that way if you can slam your opponent down with around 18 seconds then jump back in the ring). Difficulty: There are 7 difficulty levels in this FM Towns Marty version, but so far I’ve only played the game on Very Easy. After the first 3 matches, the game did get a bit more difficult, and I kept losing to Zalazof after getting Tombstoned! If the computer hits a finisher on you, it depletes a lot of your energy, and sometimes this will happen repeatedly! If the computer character turns red, stay away! This means they are more likely to win a grapple. If you turn red, grab them quick! Learning your characters finisher, which you can execute well before your opponent’s life is almost gone, is paramount to winning matches. Even still, I had no trouble fighting through the game despite losing a few matches here and there. I was very satisfied with a competent but not ridiculous computer AI (and this was on Very Easy, mind you). Music: The CD music is AWESOME!!! Beautiful tracks (well, a couple are forgettable) accompany the wrestler whom you’re facing. Loading: There are load times when playing this on the FM Towns Marty. Most noticeably, after selecting your fighters you’re shown a cut scene (skippable by pressing Run) of the two combatants approaching the ring. After this, before the match begins, there can be up to a 20 second black screen while the game loads your fight – sometimes a little shorter, like around 7-10 seconds. I personally don’t mind this, as it’s just one of the nuances of playing retro games, particularly CD games, and I do like that I don’t have to look at the words NOW LOADING at all, as the programmers didn’t put it in – just a black screen until your fight begins. Aside from this, there is no significant loading, and the matches play perfectly. The Crowd: In the SNES version, and the Arcade, and I believe the Genesis version, the crowd has some animation and moves a bit. In this FM Towns Marty version, they’re static. Meh, I never notice as I’m busy trying to whip my opponent. Camera flashes occur from the crowd, especially when you hit a slam. Language Barrier? No, not at all. The demo shows a character ‘card’ with the wrestlers’ names in English, but a description of them in Japanese, and the quotes that accompany the pictures of the wrestlers after a match are in Japanese, but all of their names are in English, the Options (Set Up) screen is in English, and the wrestling ring has English on it, so you’re good to go. The Southern Gentleman’s Opinion and Letter Grade: B. Compared to the other versions, sure, it’s not as “complete” without the Team Battle Royal. However, the CD music is awesome, the game controls great (and simply), the difficulty is just right, and it’s really, really fun! The characters are huge and have a lot of personality, which I particularly love. A must have for the obscure FM Towns Marty!